Come for the wine, stay for the pig. Porto, perhaps better known for the sweet wine bearing its name, the city keeps it real with some sandes de pernil, Porto pulled pork sandwiches, that you can find in snack bars across town. Like most snack bars, you will find a simple overhang sharing the logo of its beer on tap and likely the name of the owner. 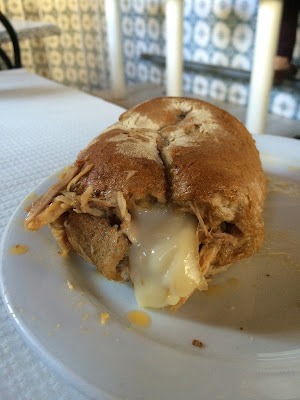 At Casa Guedes, a man named Senhor Cesar, the owner of this fine establishment, pulls pieces of pork from a freshly roasted hog, covers them in a mixture of their own juices and secret ingredients, and then stuffs the pork and a proportionate piece of queijo serra de estrela into a crusty roll. Served on a simple white plate, the combination is an incredible mixture of succulent, savory pork with a gooey, tangy, sheep's milk cheese held together by the crust of the local roll that absorbs that good good. An ice cold, Super Bock washes it down perfectly so that you can order a few more to start your afternoon right. 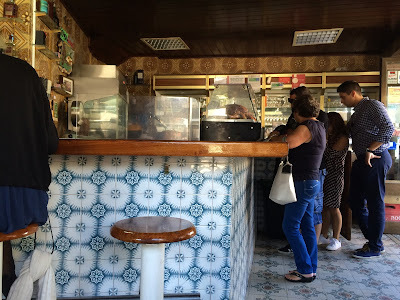 There is not much space between the tiled-walls in this joint unchanged since the 70s, but for under €5, you can enjoy one of the finest lunches Oporto has to offer.